In Polypropylene Pleated Filter Cartridges, we use the very latest gradient density micro fiber media technology, to provide a combination of excellent micro ratings, high flow rates and high contaminant holding capacities. A special combination of polypropylene media with variation in the fiber diameter has created a gradient density matrix, ranging from open on the outside to finer on the inside, thereby providing a filter with in filter, which considerably increases contamination holding capacity & throughputs. All components used in the manufacturing are biologically safe, chemically inert, and meet FDA and other international quality requirements. Polypropylene offers an extremely broad chemical compatibility, making it suitable for many applications. 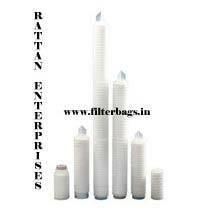 Polypropylene Pleated Filter Cartridges are precisely manufactured for use in critical filtration applications within Pharmaceuticals, Biotech, Beverages, Brewing, Food, Dairy, Semiconductors, Water Treatment, and other demanding process industries.